Arthur Allen • 2014, Norton, 384 pp. Science books often tell how a scientist has explored one bit of the world. Medical stories tell how a valiant doctor struggled to cure one disease. But this scientific-medical history tells us how one courageous scientist beat the odds and saved hundreds of scientists from deportation and death. The scene in Arthur Allen’s new book was World War II Poland, a country wracked by oppression, occupation and deportation. In the city of Lwow, Rudolf Weigl’s lab made vaccine against typhus, a dreaded bacterial disease that, spread by body lice, afflicts soldiers and refugees. Lwow, now Lviv, Ukraine, was occupied by the Soviets in 1939, the Germans in 1941, and then the Soviets once again in 1944. Weigl had developed the best typhus vaccine in the world, so his skills were in great demand during the war. Item #1 on Weigl’s vaccine recipe was herds of lice to grow the typhus bacterium. Since lice feed on human blood, that entailed a herd of human blood donors. In Weigl’s lab, these “feeders” strapped cages to their legs, waited 45 itchy minutes as the parasites drank their fill, and then replaced the cages with new ones. That need for human subjects allowed Weigl to employ scientists and mathematicians, saving them from deportation (and likely death) by whichever tyranny happened to be cracking the whip at the moment. 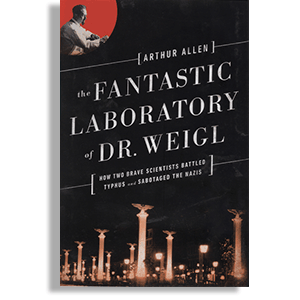 A contrast to Weigl’s “fantastic laboratory” comes from descriptions of atrocious Nazi “medical experiments” at the death camps Auschwitz and Buchenwald, where a department of typhus and vaccine research attempted to keep the German military machine healthy. And that, finally, expresses the heart of this book: How scientists can live in the world, instead of apart from it. When cruelty became normal under two of the most savage tyrannies of the 20th century, Rudolf Weigl had the courage, intelligence and scruples to resist.